About 25% of patients with chronic obstructive pulmonary disease (COPD) will develop cachexia (fat-free body mass index <17 kg·m−2 (males) or <14 kg·m−2 (females)). This is associated with ∼50% reduction in median survival. The pathogenetic mechanism has been variously suggested to result from the following: 1) energy imbalance; 2) disuse atrophy; 3) tissue hypoxia from arterial hypoxaemia; 4) systemic inflammation; and 5) anabolic hormonal insufficiency. Genetic polymorphisms implicate inflammatory cytokines, especially interleukin (IL)-1β, but IL-6 and tumour necrosis factor (TNF)-α do not show polymorphisms in these patients. Early reports of elevated TNF-α levels suggested a role for inflammation, but recent studies have not shown elevated levels of either IL-6 or TNF-α. Therapeutic trials of nutritional support, hormonal supplementation, anti-TNF-α immunotherapy, ghrelin and antioxidants have been conducted, but only a few have shown any benefits in muscle structure and function. Considerably more mechanistic knowledge is needed before therapeutic recommendations can be made. At this time, it is not possible to attribute cachexia in COPD unequivocally to inflammation or any other cause, and much more research is needed. To date, studies have been predominantly cross-sectional, with measurements made only after cachexia has developed. Future research should target prospective observation, studying patients as cachexia progresses, since once cachexia is established, inflammatory cytokine levels may not be abnormal. There have been several recent reviews of cachexia in chronic obstructive pulmonary disease (COPD; see, for example, 1–6). They conclude that cachexia in COPD patients who are not regularly taking steroids is multifactorial, based on nutritional insufficiency, increased metabolic rate, hypoxaemia, sympathetic upregulation, inactivity, oxidative stress, inflammation, anabolic hormone insufficiency and altered leptin levels, perhaps all acting on a genetic predisposition in susceptible patients. Why then is another review necessary at this time? The European Respiratory Society Research Seminar on Comorbidities in COPD held in Rome in February 2007 challenged us to examine, amongst other topics, the current standing of inflammation as the cause of cachexia and, after careful reading of both prior reviews and primary research articles, the current author is forced to conclude that there is still no direct evidence for a cause-and-effect relationship between inflammation and cachexia. The circumstantial evidence is, however, tantalising and, ultimately, current views may prove correct. Thus, the message from the present article is to not yet consider the mechanism(s) of cachexia in COPD as well defined. Much more research is needed, as the present review will specify at the end. Much of the “easy” correlative research that has informed the above-mentioned reviews has already been carried out. What is now called for is the more difficult, time-consuming and expensive cause-and-effect research to take the present understanding of cachexia mechanisms to a level that will allow subsequent studies to focus the development of the most rational therapeutic approaches to this common and very debilitating problem. The present article will cover several aspects of cachexia in COPD, beginning with the definition of cachexia, its prevalence and its importance, in order to frame the discussion. It will then examine the several potential mechanisms that have been proposed to underlie the development of cachexia, including several genetic polymorphisms that have been suggested as conveying susceptibility to cachexia. Particular attention is given to the possible role of inflammation in its pathogenesis. There have been several therapeutic intervention trials in cachexia with mixed results, and they will also be reviewed. However, the purpose of examining therapies is not to render judgement on how best to manage such patients, but to ask whether these trials shed light on the pathogenesis of cachexia. The present article will end with a list of perceived major research opportunities. Cachexia in any disease refers to a state of severely and pathologically low weight, due principally to the loss of mass of tissues other than fat. While a process of weight loss is implied, in a given patient the time course and degree of weight loss may not be known. Cachexia is a hallmark of certain disease entities, such as various cancers, and some infectious diseases, such as tuberculosis. It is, however, not uncommon in COPD itself. To ascribe cachexia to COPD, one must, of course, be sure that one is not dealing with these other diseases. As all pulmonologists know, COPD is associated with lung cancer through their common aetiology, namely tobacco. Cachexia was, until recently, measured using body mass index (BMI), which is body weight in kilogrammes divided by the square of body height in metres. Normal values are in the low-to-mid 20s (kg·m−2). Using BMI, cachexia in COPD is acknowledged to exist when BMI is <21 kg·m−2 7. The problem with using BMI is that this parameter does not distinguish between two people of similar BMI but different body composition. Specifically, different fat versus nonfat contributions to total weight may exist in patients with the same BMI 8. Thus, a COPD patient may well have lost considerable lean body mass but may have extra fat stores resulting in an overall normal BMI. Such a patient should be considered as possibly cachectic. Conversely, a COPD patient of the same BMI but with low body fat and well-preserved lean body mass would not be considered cachectic. Thus, it has recently been suggested that cachexia should be defined by lean body mass index (LBMI), which is also measured in kg·m−2. Schols et al. 7 propose that when LBMI is <16 kg·m−2 in males and <15 kg·m−2 in females, cachexia is present 7. Since LBMI is a continuously distributed variable, no single criterion value can be theoretically perfect as a cut-off. One principle for defining limits of normal in continuously distributed variables that are reasonably normally distributed is to determine the lower 95% confidence limit, and to use that as a probabilistic cut-off. Schutz et al. 9 show that 95% of normal males have an LBMI >17 kg·m−2 and that 95% of females have an LBMI >14 kg·m−2. The distinction between BMI and LBMI is not academic. Fundamental to the issue is the understanding that cachexia is really best defined by loss of lean body mass. This in turn implies a pathological process of excessive protein breakdown, not simply a burning of stored fat. The prevalence of cachexia is variously presented as 20–40% of the COPD population 10, 11, and is probably closer to the lower end of this range. Note that in the article by Congleton 10, prevalence was defined on the basis of ideal body weight being <90% of the predicted, while in the article by Schols 11 it was based on reduced fat-free mass. These two studies reported prevalence values of 36 and 20%, respectively, in patients described as having “moderate-to-severe COPD”. It is possible that the higher value in the article by Congleton 10 represents at least in part the inclusion of some patients whose weight was diminished by loss of fat rather than of lean body mass. Thus, by taking a value of 25% for the sake of discussion, this means that only one out of four COPD patients are destined to become cachectic, while three out of four will not. The obvious question becomes “what is it that separates COPD patients into these two very different phenotypic groups?” In short, the answer is not yet clear. Genetic polymorphisms associated with specific pro-inflammatory cytokines have been found in COPD; however, while this is a promising line of investigation, these studies seem to raise more questions than they answer. They will be discussed below in some detail. It is likely that while genetic susceptibility will be found to be important, environmental factors, such as tobacco dose, regular exercise, dietary elements, hormonal levels and so on, will also play a role. As with most clinical syndromes, the answer to this simple question is likely to be very complex. 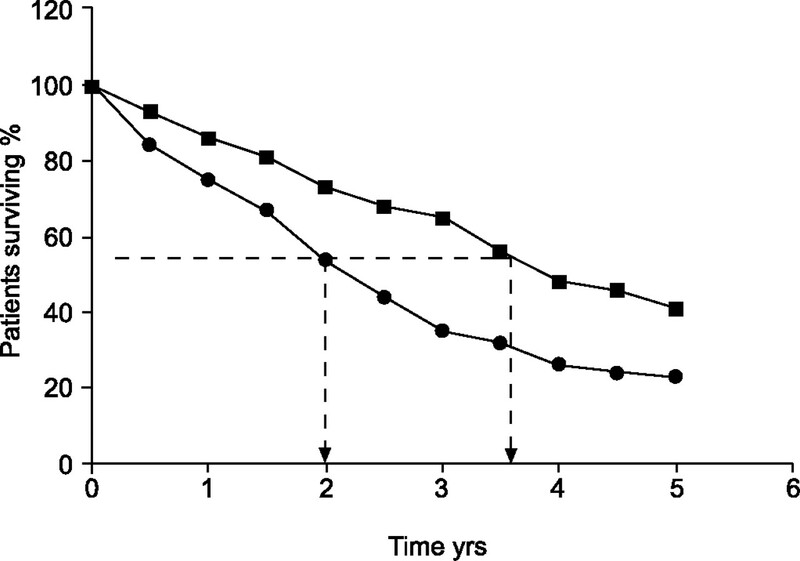 The significance of cachexia in COPD is starkly evident in survival curves, as shown by Schols and co-workers 7, 12. Using the above LBMI definitions, Schols et al. 7 showed that median survival was cut almost in half by cachexia (fig. 1⇓), from just under 4 yrs to just over 2 yrs. The differences in survival are not due to differences in severity of COPD by spirometric criteria, for which adjustments were made between the two groups in figure 1⇓. What is not known is whether cachexia can be prevented, or even reversed, once developed, and how this will affect survival. Survival in patients with chronic obstructive pulmonary disease according to the presence of cachexia. Median survival is almost twice as short in cachectic patients (•) as in noncachectic patients (▪). Cachexia was considered to be a fat-free mass index <16 kg·m−2 in males and <15 kg·m−2 in females. Reproduced from 7, with permission from the publisher. The other obvious consequence of cachexia relates to impaired quality of life. With fatigue and weakness being even greater than for noncachectic COPD patients, cachexia worsens the quality of life considerably. The finding that only one out of about four patients with COPD develops cachexia has prompted studies looking for genetic polymorphisms that may underlie differential susceptibility 13. It is very early in the search for such altered genes and, even though some associations have surfaced, cause and effect remains to be established in each case. The favourite targets for these studies have been genes encoding pro-inflammatory molecules, such as tumour necrosis factor (TNF)-α, some of the interleukins (ILs), and bradykinin. This is because most people have approached cachexia on the hypothesis that it is based on continued systemic inflammation (as will be discussed hereafter). The most striking polymorphism finding to date is shown in figure 2⇓, where Broekhuizen et al. 14 found that a -511 polymorphism in the IL-1β gene correlated strongly with cachexia. 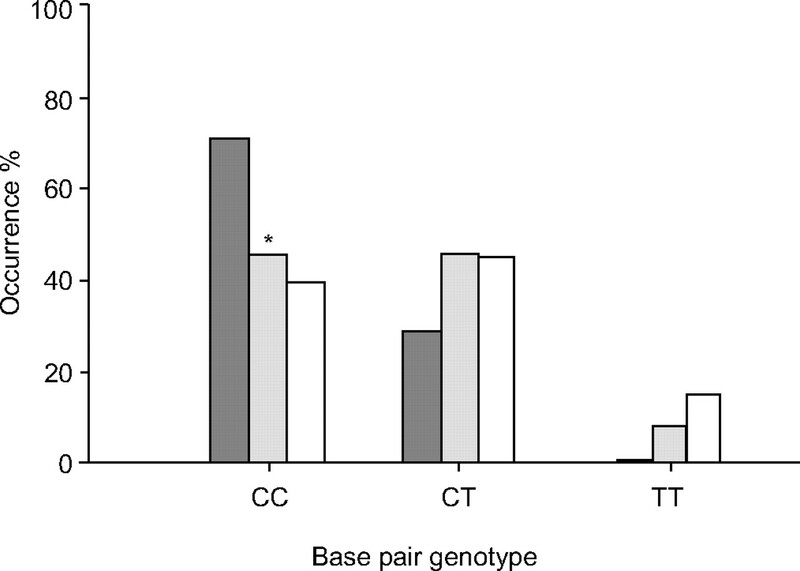 As figure 2⇓ shows, the CC genotype at this position in the gene was associated with frequent cachexia, while the TT genotype was not associated with cachexia. The heterozygous CT genotype had an intermediate association with cachexia. Of interest, the authors found that circulating IL-1β was undetectable in all three genotypes, casting doubt on the functional significance of the genetic outcome. However, is this interpretation of the data correct? By definition, cachexia was already present when the studies were done. It is quite reasonable to hypothesise that IL-1β may be key, but had its effects much earlier in the process. It would take an expensive, long-term, prospective cohort study to address this notion. It may also be that circulating IL-1β is not the relevant variable, and that IL-1β levels in muscle may be more important. It is possible that the differences still exist there, even while circulating levels are not different among groups; this was not addressed by direct sampling. At this point in time, no clear message emerges: the association with IL-1β is tantalising, and may reflect a cause-and-effect relationship, but this is presently not known. Association of the -511 CC polymorphism with cachexia in patients with chronic obstructive pulmonary disease (COPD). While the CC variant is not necessary for cachexia to develop, the TT genotype appears protective. ▒: cachectic patients with COPD; ░: noncachectic patients with COPD; □: normal subjects. *: p<0.05. Another polymorphism that associates with cachexia is in the bradykinin receptor, as shown by Hopkinson et al. 15 in figure 3⇓. The effects are modest, but suggest that the +9/+9 insertion polymorphism is more prevalent in patients with low LBMI. However, the difference between these patients and those without the insertion (-9/-9) in LBMI is not significant per se (fig. 3⇓). Furthermore, that heterozygotes had a higher LBMI than the (-9/-9) patients was unexpected. It is noteworthy in figure 3⇓ that, while LBMI may have slightly differed between (+9/+9) and heterozygotes, BMI itself was not different, and those with low LBMI therefore must have had relatively large fat stores. Most cachectic patients do have low BMI, not just low LBMI, although the distinction may not always hold, as mentioned earlier. Hopkinson et al. 16 and Gosker et al. 17 also examined the ACE gene and found a polymorphism-based association with muscle strength in COPD. Fat-free body mass in patients with chronic obstructive pulmonary disease in 110 patients according to bradykinin insertion genotype. The (+9/+9) insertion variants have cachexia, heterozygotes and normal subjects do not. It is not clear why normal subjects have a lower fat-free mass index (FFMI) than heterozygotes (c.f. -9/+9 and -9/-9 variants). ▒: body mass index (BMI) 23.5 kg·m−2; □: BMI 24.1 kg·m−2. Reproduced from 15, with permission from the publisher. Other cytokines that have been examined for cachexia-related polymorphisms include TNF-α and IL-6. In both cases, no polymorphisms have been found 14. This is disappointing in that both of these pro-inflammatory molecules have long been regarded as prime candidates in the development of cachexia. Moreover, Langen et al. 18 studied transgenic mice engineered to overexpress TNF-α (in the lungs only) and found loss of muscle mass as a result. This can be taken as a “proof of concept” that TNF-α coming from the lungs is capable of inducing reduction in LBMI. Whether this allows one to implicate TNF-α in human cachexia is debatable and will be further discussed below. With the possibility that patients with COPD being susceptible to cachexia is determined by their genes, the actual mechanisms proposed to explain loss of lean body mass can now be discussed. The mechanisms are listed in table 1⇓, and will be addressed in sequence. Historically, the first mechanism to be discussed was energy imbalance, but this theory has lost some favour as the primary cause of cachexia. It was postulated that due to airways obstruction, the work of breathing was increased, 24 h a day, 7 days a week. Whether work of breathing explains the results or not, hypermetabolism has been noted, for example, by Sergi et al. 19, where resting energy expenditure was found to be 10% higher in COPD patients than in normal subjects of a similar age, height and weight. The oxygen cost of exercise has also been found to be higher than in normal subjects 20. Without a corresponding increase in caloric intake, patients would inexorably lose weight because obstruction was irreversible. Supporting this idea, use of noninvasive positive pressure ventilation has been shown to increase free-fat mass index (FFMI) 21. In addition to this concept, it is known that there is some fibre-type shift in skeletal muscle in COPD away from type I and towards type II. It is also known that type II muscle uses more oxygen per unit work output than type I, thus, there is an extra metabolic load due to oxygen-inefficient muscle usage. Another factor is that cachexia itself leads to anorexia 22, and this must create a vicious circle, such that the more weight lost, the less food is taken in. Aggressive nutritional augmentation and appetite stimulation have not solved the problem 10, 23, 24, casting some doubt on the centrality of this mechanism. Creutzberg et al. 25 found that poor responders to nutritional therapy were somewhat older, had less appetite and evidence of more inflammation. The statistical contribution of inflammation, parameterised by the concentration of soluble TNF-α receptor 55, was small (0.1 in a total R2 of 0.8) and the receptor levels were identical between patients who gained <2% body weight and those who gained 2–5% body weight. Furthermore, it is impossible to know from such studies whether the correlation with inflammation is causative. Consequently, their findings cannot be concluded as proving a role for inflammation in the poor response to nutritional therapy. However, their data do provide the basis for future research on the causative role of inflammation in cachexia. Despite these uncertainties, nobody would advocate anything other than assuring optimal nutrition in all COPD patients. It has been suggested that the hypoxaemia of COPD is a causative factor in cachexia. Hypoxaemia may increase the generation of ROS and TNF-α 31, which may in turn give rise to inflammatory changes leading to cachexia. However, the degree of hypoxaemia in COPD is often mild, with arterial oxygen tension (Pa,O2) in the range of 8–9 kPa (60–70 mmHg). Normal individuals residing at modest altitudes of 1,500–3,000 m have similar Pa,O2 values, yet do not become cachexic. Many COPD patients with similar degrees of hypoxaemia do not become cachectic, and patients with far lower Pa,O2 values, such as in cyanotic congenital heart disease, are not generally cachectic (absent evident cardiac failure). That said, it is well known in climbing circles that even short sojourns by healthy, fit, young subjects to altitudes above about 5,000 m result in inexorable loss of lean body mass. It is also known that arterial hypoxaemia appears to stimulate cytochrome oxidase in patients with COPD in a dose-dependent manner 32. This suggests that the muscles are responsive to hypoxaemia, at least in terms of this enzyme, and could possibly respond more generally to hypoxia. Finally, hypoxaemia may stimulate the sympathetic nervous system, and this itself has been shown to produce systemic inflammation 33. Thus, the importance of hypoxaemia as a factor leading to cachexia remains in question. There are clues to the importance of hypoxaemia, but several findings, as just mentioned, prevent assignment of a clear cause-and-effect relationship between hypoxaemia and cachexia. Systemic inflammation has become the primary focus of research into the genesis of cachexia in COPD. There is considerable evidence that this may be important, but there are many gaps in present knowledge that stand in the way of making any definitive statements about the role of inflammation. The molecules receiving the greatest amount of attention are TNF-α, IL-1β, IL-6, C-reactive protein, and ROS and reactive nitrogen species (RNS). There may also be a link between inflammation and low leptin levels 34, 35. TNF-α is a molecule that has among its effects the upregulation of the transcription factor NF-κB, which in turn upregulates the protein breakdown machinery in cells, providing a molecular mechanism for muscle loss. TNF-α has been measured in circulating plasma of cachectic patients, and the data are shown in table 2⇓. As can be seen, an interesting temporal pattern in TNF-α levels is reported. In 1994, Di Francia et al. 36 found large differences between cachectic and noncachectic COPD patients, with very high levels in the former. Five years later, in 1999, Takabatake et al. 34 found 10-fold smaller values and only slight differences, as did Eid et al. 37 in 2001 and also Itoh et al. 38 in 2004. Even more recently, reported absolute TNF-α levels appear even lower, and differences between patient groups cannot be seen 14, 39. The high absolute levels from early studies that fall systematically over time suggest a degree of nonspecificity in the assay in past years. It seems reasonable to suggest that the low levels currently found are likely to be due to improving test specificity. The outcome is that recent studies show no difference in TNF-α levels across cachectic and noncachectic groups of COPD patients. Furthermore, TNF-α polymorphisms have not been identified, despite a search 14. Finally, a recent clinical trial of short-term anti-TNF-α treatment in general patients with COPD (not limited to cachectic patients) found no effect 40. That said, a transgenic mouse model of lung-limited TNF-α overexpression has shown a loss of body weight 18. This suggests that COPD-related inflammation within the lungs has the potential to contribute to cachexia, presumably via systemic release of TNF-α. However, the arithmetic is hard to believe when the mouse response is compared with human findings. Thus, even taking into account, for example, the older data of Takabatake et al. 34 showing a 20% higher TNF-α level in patients than in controls, those patients had a 25% lower body weight. In the above-mentioned transgenic mouse study 18, the TNF-α levels were 600% higher than in control mice, but the body weight was just 9% less. These numbers imply that, per unit rise in circulating TNF-α, the weight in humans must be 80-fold more sensitive to TNF-α than in mice, which is hard to believe. As well as TNF-α, IL-1β has been considered for its role in cachexia 14. As shown in figure 2⇑, there is a striking association between the -511 CC polymorphism and cachexia, but the same authors assessed circulating IL-1β levels in their subjects and were unable to find measurable levels in any group 14. This negative finding does not support a role for this molecule, at least in established cachexia. IL-6 levels have been found to be slightly elevated in cachectic COPD patients 39, a finding that also remains an association rather than indication of cause and effect. Blood leptin levels may be reduced 34, but whether this applies to all COPD patients or only those with cachexia is not clear from the article by Takabatake et al. 34. It is known that reduced leptin levels are generally associated with weight loss, and high levels with weight gain, but this may be mostly attributable to effects of leptin on fat rather than muscle. In keeping with this concept, Schols et al. 41 found that leptin levels were reduced in emphysematous patients with low BMI (leptin 2.6 ng·mL−1; BMI 21.6 kg·m−2), compared with chronic bronchitic patients with higher BMI (leptin 5.1 ng·mL−1; BMI 25.1 kg·m−2). However, fat-free mass was the same in the two groups, and it was the amount of fat that explained the weight differences. It is possible, and even likely, that the reduced leptin levels are the consequence rather than the cause of the lower fat mass. It has also been reported that inflammatory cytokines actually stimulate leptin 42, 43; ordinarily, this would be expected to raise and not lower weight. Thus, taken together, it does not seem likely that reduced leptin is a major mediator of cachexia as defined by fat-free mass reduction. Conversely, leptin may significantly affect fat mass, and thus BMI, in patients with COPD. This emphasises the mechanistic importance of defining cachexia by fat-free mass. Oxidative stress is greater in COPD patients than in controls, and the oxidised/reduced glutathione ratio is also increased 44, 45. Furthermore, exercise training appears to accentuate oxidative stress in COPD 46. Thus, ROS and/or RNS may play a role in cachexia as molecules capable of incurring tissue damage. However, these authors 46 found that cachectic patients were able to increase their exercise capacity after training, and by relatively the same amount as noncachectic patients and normal subjects. In this context, it should not be forgotten that ROS can also serve as signalling molecules in the process of adaptation to exercise. It remains a puzzle whether exercise, both acute and repeated (training), is pro- or maladaptive in these patients, and thus whether exercise has positive or negative (or no) effect on quality of life and mortality in cachexia. Of course, as part of a comprehensive rehabilitation programme, exercise does enhance the quality of life in the general COPD population. All of the studies examining inflammatory mediators and oxidative stress in patients with COPD are, by necessity: 1) observational, 2) mostly limited to circulating plasma level measurements, and 3) conducted long after cachexia has become evident. These are major limitations to the interpretability of these studies. It is entirely possible that the quoted results are, biologically and not statistically speaking, falsely positive in terms of cause and effect when differences between cachectic and noncachectic patients are found. Similarly, it is entirely possible that the results are biologically falsely negative when no differences are found. This may be for the simple reason that circulating levels may not reflect concentrations in skeletal myocytes, where the cachectic process takes place. It may also be the case that inflammation is important in the pathogenesis of cachexia, but only early on in the process. Thus, by the time cachexia is evident, the major steps in the process are complete, and blood levels of cytokines may no longer have a relationship with the myopathic state. It is also possible that associations found between cytokines and cachexia are not related by cause and effect. However, even if they do turn out to have a cause-and-effect relationship, it may be that cachexia explains the cytokine patterns rather than the possibility that the cytokine levels explain cachexia. It is critical to keep these limitations in mind when evaluating reports of cytokine measurements. The conclusion that must be reached regarding the role of inflammation in causing cachexia in patients with COPD is that it remains unknown. The good news is that there are plenty of tantalising correlations to allow good hypotheses to be advanced; the challenge is to design feasible and ethical studies with which to test cause and effect. There is evidence that insufficiency of one or more of three hormones may contribute to cachexia. Creutzberg and Casaburi 47 provide a succinct overview of endocrine factors in COPD. These hormones are testosterone, growth hormone and insulin-like growth factor. Observational studies in cachectic COPD patients have found diminished circulating levels of these hormones 48, 49. These hormones may be a rational choice for factors contributing to cachexia but, as stated above, this does not mean that observed associations prove cause and effect. Much more research will be required to establish this association. While increased thyroid activity could lead to weight loss, there is no evidence that this happens systematically in COPD 47. Ghrelin, a naturally occurring growth hormone-releasing peptide, has been found to be increased in cachectic COPD patients 38, although the relationship is not statistically strong (R2 = 0.14). At first sight, high ghrelin levels should promote weight gain, which by definition has not occurred in these patients. Perhaps the elevated levels represent a feedback loop in response to low growth hormone levels, signalling a need which cannot be met and whose components have yet to be identified. It is possible that some otherwise normal subjects undergo accelerated ageing. Since ageing is associated with loss of lean body mass 50, it is possible that those subjects with COPD who develop cachexia are those who, in the absence of their disease, would have shown accelerated ageing and loss of lean body mass. Therefore, this hypothesis does not depend on cigarette smoking. However, the prevalence of cachexia (in normal subjects in the 60–75-yr-old age group in which COPD is most commonly studied) as defined by an LBMI <16 kg·m−2 in males and <15 kg·m−2 in females is likely to be lower that that in COPD. This would suggest that accelerated ageing per se (independently of smoking) may not account for much of the cachexia that is seen in COPD patients. Conversely, several studies have shown that tobacco smoke exposure leads to accelerated senescence of pulmonary fibroblasts 51–54. While this does not prove that similar effects occur in muscle and are responsible for reduced lean body mass, it does demonstrate mechanisms of accelerated cell senescence in smokers that might eventually be shown to contribute to cachexia. It leaves open the question of why only some patients develop cachexia if cigarette smoke universally accelerates cell senescence. Many different approaches to treating cachexia have been attempted, and are listed in table 3⇓. They are briefly reviewed herein, not for clinical recommendations but rather for the light they shed on pathogenetic mechanisms of cachexia development. Schols 23 has long advocated for nutritional support (including vitamins and antioxidants) as part of an integrated approach to the patient with COPD, especially when cachectic. While it is likely that nobody would argue against this, the improvement provided by dietary modification has been somewhat inconsistent. Even when appetite stimulants are used, the net result has been modest 49. Whether attention to diet would be more effective earlier in the course of disease, before cachexia had developed, remains to be tested. Indeed, this comment applies to all of the treatments listed in table 3⇑. Exercise training has always been regarded somewhat like nutritional support: an obvious adjunct to therapy in chronic diseases of most types, especially those associated with weight loss. However, recent findings have suggested that exercise creates an oxidative stress challenge 45, 46 that COPD patients may not be able to deal with. Markers of oxidative stress are increased by exercise, as are those for lipid peroxidation, indicating cell membrane damage. At the same time, antioxidant state is depressed in these patients, and cytokines such as IL-6 are elevated in the plasma. The implication of these studies is that exercise training may prove disadvantageous in the long term. This must be balanced against the findings that exercise training does in fact lead to a substantial improvement in exercise capacity, even in cachectic patients. The relative magnitude of these gains is similar to that seen from training of normal age-matched subjects. It will be important to determine if training improves or worsens either quality of life or mortality, given the significantly higher mortality rate in cachectic in comparison with noncachectic COPD patients (fig. 1⇑). Whether preventing arterial hypoxaemia has any influence on either the development or reversal of cachexia is not known, and it will take substantial prospective cohort studies to answer this question. If oxygen were found to be of benefit, it would be a relatively simple and cost-effective approach to treating a disease where supplemental oxygen is already frequently used, albeit mainly to decelerate the development of pulmonary hypertension and cor pulmonale. Several approaches using anti-inflammatory drugs have been tried, or at least proposed for formal trial. The antioxidant N-acetyl cysteine has been found to reduce oxidative stress markers and, at the same time, to improve exercise endurance time 44. This study was of quite a short duration did not address weight changes, and longer term trials of this generally benign and promising drug may be warranted. Reducing proteasomal protein degradation has been suggested as a therapeutic target. A proposal has been advanced to use eicosapentanoic acid to reduce proteolysis inducing factor 55, but no study has been reported yet. Similarly, advocates of the theory of heightened hypoxia-induced sympathetic activation have proposed a study of β-sympathetic blockade 33, but this has also not been reported. Of course, β-blockade is well known to be a concern in diseases of airways obstruction because of the risk of bronchoconstriction. Finally, it has been proposed to study inhaled steroids and bronchodilators as modulators of inflammation and, thereby, as agents to prevent or reverse cachexia 56. Treatment with growth hormone and insulin-like growth factor have been studied in COPD patients 57. The outcomes have been mixed in that while fat-free body mass was increased, no accompanying benefits to skeletal muscle function were detected 57. In a similar approach, nandrolone 48 and oxandrolone 58 have also been studied, with very similar outcomes: increased fat-free mass but no increase in muscle strength. In the context of growth hormones, mention should be made of ghrelin, a growth hormone-releasing factor. Ghrelin has been found to increase fat free body mass and increase the distance patients can cover in the 6-min walk test 59, 60. Noninvasive positive pressure ventilation appears to result in a gain in total body mass 21. Whether the mechanism is based on reduced work of breathing and, thus, on enhanced energy balance is unclear. The authors also report only on total body mass, and not fat-free mass. Creatine supplementation has been reported to produce increased fat-free mass and also to lead to improved muscle strength 61. This single report in ∼20 patients needs to be repeated by others and confirmed, as it describes another relatively simple approach with promising preliminary findings. Based on animal studies 62, melanocortin-4 inhibitors have been proposed, but not yet studied. Omega-3 fatty acids have also been proposed but not yet tested 63. That said, there is some evidence that a diet rich in omega-3 polyunsaturated fatty acids A and B improves skeletal muscle function in COPD 62, 63. The basis of their action is thought to be in their anti-inflammatory effects, but in the two studies 62, 63, a reduction in cytokine levels was found in one but not the other. It is also noteworthy that while these studies were not designed to address cachexia per se, they found no effect on body composition compared with patients treated similarly except for diet. Finally, angiotensin-converting enzyme inhibition has also been suggested as a treatment for cachexia, but remains to be investigated 59. What all of these therapeutic approaches show is that many different pathways could affect the development of cachexia in COPD. All have been studied or proposed based on a physiological rationale that is generally clear and comes from pilot data or animal studies of possible responsible mechanisms. Just as with the cautions applied to interpreting human data associating cellular or molecular findings with cachexia, interpreting responses to these many therapies also requires caution. A negative effect may mean that a beneficial approach was attempted too late in the course of disease, in an insufficient dose, for insufficient duration, or as an isolated drug trial without adding in the several other factors that rehabilitation studies have indicated are important to foster, such as education, activity, diet, etc. A positive result may look encouraging, and speaking empirically that may be the case. However, the burden of proof falls to the investigator to tie any positive result to the basic mechanism of cachexia in the first place. A given treatment may possibly work by “supersizing” a parallel process that is normal, rather than by restoring the primary abnormal process, which may well remain “broken”. Again, as with all new therapies, long-term negative side-effects cannot be ignored. The present brief review has examined research findings concerning mechanisms of cachexia in chronic obstructive pulmonary disease based on a variety of studies. Some have associated biomarkers with cachexia, others have taken a genetics approach, and still others are based on therapeutic responses to experimental treatments. It seems fair to say that today, the full story is still not known and, as a result, there are many important research gaps remaining to be filled; those seen to be most important are summarised in table 4⇓. It is hoped that these questions will be pursued in the coming years and that their answers will lead us to a better understanding and, as a result, management of cachexia in chronic obstructive pulmonary disease. Balasubramanian V, Varkey B. Chronic obstructive pulmonary disease: effects beyond the lungs. Curr Opin Pulm Med 2006;12:106–112. Debigare R, Cote CH, Maltais F. Peripheral muscle wasting in chronic obstructive pulmonary disease: clinical relevance and mechanisms. Am J Respir Crit Care Med 2001;164:1712–1717. Degens H, Alway SE. Control of muscle size during disuse, disease, and aging. Int J Sports Med 2006;27:94–99. Farber MO, Mannix ET. Tissue wasting in patients with chronic obstructive pulmonary disease, the acquired immune deficiency syndrome, and congestive heart failure. Neurologic Clinics 2000;18:245–262. Morley JE, Thomas DR, Wilson M-MG. Cachexia: pathophysiology and clinical relevance. Am J Clin Nutr 2006;83:735–743. Orozco-Levi M, Lloreta J, Gea J. The “oil well analogy” as a comprehensive interpretation of factors leading to muscle injury and wasting. Ultrastruct Pathol 2006;30:247–252. Schols AMWJ, Broekhuizen R, Weling-Scheepers CA, Wouters EF. Body composition and mortality in chronic obstructive pulmonary disease. Am J Clin Nutr 2005;82:53–59. Schols AM, Soeters PB, Dingemans AM, Mostert R, Frantzen PJ, Wouters EF. Prevalence and characteristics of nutritional depletion in patients with stable COPD eligible for pulmonary rehabilitation. Am Rev Respir Dis 1993;147:1151–1156. Schutz Y, Kyle UUG, Pichard C. Fat-free mass index and fat mass index percentiles in Caucasians aged 18–98 yr. Int J Obesity 2002;26:953–960. Congleton J. The pulmonary cachexia syndrome: aspects of energy balance. Proc Nutr Soc 1999;58:321–328. Schols AMWJ. Pulmonary cachexia. Int J Cardiol 2002;85:101–110. Schols AMWJ, Slangen J, Volovics L, Wouters EFM. Weight loss is a reversible factor in the prognosis of chronic obstructive pulmonary disease. Am J Respir Crit Care Med 1998;157:1791–1797. Yanbaeva DG, Dentener MA, Creutzberg EC, Wouters EF. Systemic inflammation in COPD: is genetic susceptibility a key factor?. COPD 2006;3:51–61. Broekhuizen R, Grimble RF, Howell WM, et al. Pulmonary cachexia, systemic inflammatory profile, and the interleukin 1β -511 single nucleotide polymorphism. Am J Clin Nutr 2005;82:1059–1064. Hopkinson NS, Eleftheriou KI, Payne J, et al. 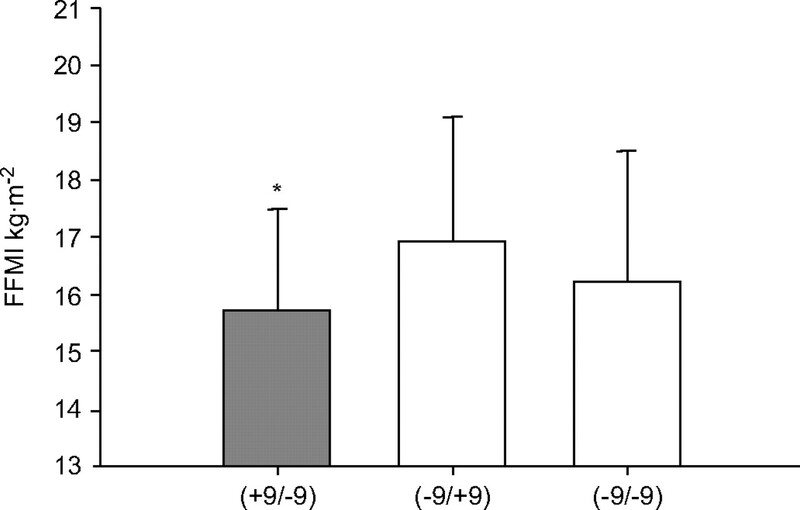 +9/+9 Homozygosity of the bradykinin receptor gene polymorphism is associated with reduced fat-free mass in chronic obstructive pulmonary disease. Am J Clin Nutr 2006;83:912–917. Hopkinson NS, Nickol AH, Payne J, et al. Angiotensin converting enzyme genotype and strength in chronic obstructive pulmonary disease. Am J Respir Crit Care Med 2004;170:395–399. Langen RCJ, Schols AMWJ, Kelders MCJM, van der Velden JLJ, Wouters EFM, Janssen-Heininger YMW. Muscle wasting and impaired muscle regeneration in a murine model of chronic pulmonary inflammation. Am J Respir Cell Mol Biol 2006;35:689–696. Sergi G, Coin A, Marin S, et al. Body composition and resting energy expenditure in elderly male patients with chronic obstructive pulmonary disease. Respir Med 2006;100:1918–1924. Richardson RS, Sheldon J, Poole DC, Hopkins SR, Ries AL, Wagner PD. Evidence of skeletal muscle metabolic reserve during whole body exercise in patients with chronic obstructive pulmonary disease. Am J Respir Crit Care Med 1999;159:881–885. Budweiser S, Heinemann F, Meyer K, Wild PJ, Pfeifer M. Weight gain in cachectic COPD patients receiving noninvasive positive-pressure ventilation. Respir Care 2006;51:126–132. Femia RA, Goyette RE. The science of megestrol acetate delivery: potential to improve outcomes in cachexia. Biodrugs 2005;19:179–187. Schols A. Nutritional modulation as part of the integrated management of chronic obstructive pulmonary disease. Proc Nutr Soc 2003;62:783–791. Schols AMWJ. Nutritional and metabolic modulation in chronic obstructive pulmonary disease management. Eur Respir J 2003;22: Suppl. 42 81s–86s. Creutzberg EC, Schols AMWJ, Weling-Scheepers CAPM, Burman WA, Wouters EFM. Characterization of nonresponse to high caloric oral nutritional therapy in depleted patients with chronic obstructive pulmonary disease. Am J Respir Crit Care Med 2000;161:745–752. Agusti A, Morla M, Sauleda J, Saus C, Busquets X. NK-κB activation and iNOS upregulation in skeletal muscle of patients with COPD and low body weight. Thorax 2004;59:483–487. Li Y-P, Schwartz RJ, Waddell ID, Holloway BR, Reid MB. Skeletal muscle myocytes undergo protein loss and reactive oxygen-mediated NF-κB activation in response to tumor necrosis factor. FASEB J 1998;12:871–880. Ottenheijm CAC, Heunks LMA, Li Y-P, et al. Activation of the ubiquitin-proteasome pathway in the diaphragm in chronic obstructive pulmonary disease. Am J Respir Crit Care Med 2006;174:997–1002. Rutten EP, Franssen FM, Engelen MP, Wouters EF, Deutz NE, Schols AM. Greater whole-body myofibrillar protein breakdown in cachectic patients with chronic obstructive pulmonary disease. Am J Clin Nutr 2006;83:829–834. Lewis MI. Apoptosis as a potential mechanism of muscle cachexia in chronic obstructive pulmonary disease. Am J Respir Crit Care Med 2002;166:434–436. Takabatake N, Nakamura H, Abe S, et al. The relationship between chronic hypoxia and activation of the tumor necrosis factor-α system in patients with chronic obstructive pulmonary disease. Am J Respir Crit Care Med 2000;161:1179–1184. Sauleda J, Garcia-Palmer F, Wiesner RJ, et al. Cytochrome oxidase activity and mitochondrial gene expression in skeletal muscle of patients with chronic obstructive pulmonary disease. Am J Respir Crit Care Med 1998;157:1413–1417. Andreas S, Anker SD, Scanlon PD, Somers VK. Neurohumoral activation as a link to systemic manifestations of chronic lung disease. Chest 2005;128:3618–3624. Takabatake N, Nakamura H, Abe S, et al. Circulating leptin in patients with chronic obstructive pulmonary disease. Am J Respir Crit Care Med 1999;159:1215–1219. Takabatake N, Nakamura H, Minamihaba O, et al. A novel pathophysiologic phenomenon in cachexic patients with chronic obstructive pulmonary disease. Am J Respir Crit Care Med 2001;163:1314–1319. Di Francia M, Barbier D, Mege JL, Orehek J. Tumor necrosis factor-α levels and weight loss in chronic obstructive pulmonary disease. Am J Respir Crit Care Med 1994;150:1453–1455. Eid AA, Ionescu AA, Nixon LS, et al. Inflammatory response and body composition in chronic obstructive pulmonary disease. Am J Respir Crit Care Med 2001;164:1414–1418. Itoh T, Nagaya N, Yoshikawa M, et al. Elevated plasma ghrelin level in underweight patients with chronic obstructive pulmonary disease. Am J Respir Crit Care Med 2004;170:879–882. van Helvoort HA, Heijdra Y, Thijs HMH, Vina J, Wanten GJA, Dekhuijzen PNR. Exercise-induced systemic effects in muscle-wasted patients with COPD. Med Sci Sports Exerc 2006;38:1543–1552. van der Vaart H, Koeter GH, Postma DS, Kauffmann HF, ten Hacken NHT. First study of infliximab treatment in patients with chronic obstructive pulmonary disease. Am J Respir Crit Care Med 2005;172:465–469. Schols AMWJ, Creutzberg EC, Buurman WA, Campfield LA, Saris WHM, Wouters EFM. Plasma leptin is related to proinflammatory status and dietary intake in patients with chronic obstructive pulmonary disease. Am J Respir Crit Care Med 1999;160:1220–1226. Grunfeld C, Zhao C, Fuller J, et al. Endotoxin and cytokines induce expression of leptin, the ob gene product, in hamsters. J Clin Invest 1996;97:2152–2157. Sarraf P, Frederick RC, Turner EM, et al. Multiple cytokines and acute inflammation raise mouse leptin levels: potential role in inflammatory anorexia. J Exp Med 1997;1:171–175. Koechlin C, Couillard A, Simar D, et al. Does oxidative stress alter quadriceps endurance in chronic obstructive pulmonary disease?. Am J Respir Crit Care Med 2004;169:1022–1027. Rabinovich RA, Ardite E, Mayer AM, et al. Training depletes muscle glutathione in patients with chronic obstructive pulmonary disease and low body mass index. Respiration 2006;73:757–761. Rabinovich RA, Ardite E, Troosters T, et al. Reduced muscle redox capacity after endurance training in patients with chronic obstructive pulmonary disease. Am J Respir Crit Care Med 2001;164:1114–1118. Creutzberg EC, Casaburi R. Endocrinological disturbances in chronic obstructive pulmonary disease. Eur Respir J 2003;22: Suppl. 42 76s–80s. Creutzberg EC, Wouters EF, Mostert R, Pluymers RJ, Schols AM. A role for anabolic steroids in the rehabilitation of patients with COPD? A double-blind, placebo-controlled, randomized trial. Chest 2003;124:1733–1742. Koehler F, Doehner W, Hoernig S, Witt C, John M. Anorexia in chronic obstructive pulmonary disease – association to cachexia and hormonal derangement. Int J Cardiol 2007;119:83–89. Thomas DR. Loss of skeletal muscle mass in aging: examining the relationship of starvation, sarcopenia and cachexia. Clin Nutr 2007;26:389–399. Morla M, Busquets X, Pons J, Sauleda J, MacNee W, Agusti AG. Telomere shortening in smokers with and without COPD. Eur Respir J 2006;27:525–528. Nyunoya T, Monick MM, Klingelhutz A, Yarovinsky TO, Cagley JR, Hunninghake GW. Cigarette smoke induces cellular senescence. Am J Respir Cell Mol Biol 2006;35:681–688. Tsuji T, Aoshiba K, Nagai A. Alveolar cell senescence in patients with pulmonary emphysema. Am J Respir Crit Care Med 2006;174:886–893. Sin DD, Man SFP, Marciniuk DD, et al. Can inhaled fluticasone alone or in combination with salmeterol reduce systemic inflammation in chronic obstructive pulmonary disease? Study protocol for a randomized controlled trial [NCT00120978] . BMC Pulm Med 2006;6:3–10. Burdet L, de Muralt B, Schutz Y, Pichard C, Fitting J-W. Administration of growth hormone to underweight patients with chronic obstructive pulmonary disease. A prospective, randomized, controlled study. Am J Respir Crit Care Med 1997;156:1800–1806. Yeh S-S, Hafner A, Schuster MW, Mantovani G, Levine DM, Parker TS. Relationship between body composition and cytokines in cachectic patients with chronic obstructive pulmonary disease. J Am Geriatr Soc 2003;51:890–891. Nagaya N, Itoh T, Murakami S, et al. Treatment of cachexia with ghrelin in patients with COPD. Chest 2005;128:1187–1193. Fuld JP, Kilduff LP, Neder JA, et al. Creatine supplementation during pulmonary rehabilitation in chronic obstructive pulmonary disease. Thorax 2005;60:531–537. Scarlett JM, Marks DL. The use of melanocortin antagonists in cachexia of chronic disease. Expert Opin Investig Drugs 2005;14:1233–1239. Kotler DP. Cachexia. Ann Intern Med 2007;133:622–634.